DALLAS - The Bears completed the season sweep over Dallas Baptist on Tuesday evening as they used a four-run fifth inning to propel themselves to a 5-1 victory at Horner Ballpark. Catcher Shea Langeliers led the way with a 2-for-4 day. He mashed his first homer of the year, a solo shot that tied the ballgame up in the fifth inning and kicked off the big inning for the Bears. First baseman Chase Wehsener was outstanding for the Bears in the nine hole, going 3-for-3 with one walk and one run scored on the day. Nick Loftin led the way in the RBI category, driving in two runs on one hit and one sac fly. The Bears (21-7) used a four-run fifth inning to complete their 13th come-from-behind victory of the year. The inning began with Shea Langeliers connecting on his first home run of the year and from there the Bears added three more on two hits, taking advantage of three errors by the Patriots (21-7). Josh Bissonette, Loftin and Cunningham delivered RBIs in the inning. From there the Bears added one more in the seventh inning on a Loftin sac fly, but it was the pitching staff that held things together down the stretch against an excellent hitting ballclub in DBU. The Bears used six different pitchers on the day. Starter Jacob Ashkinos went two-complete in his first start of the year and was followed up by freshman righty Brooks Helmer. The Rockwall, Texas, native threw a career-best 2.0 innings and gave up the lone run on the day to the Patriots, a solo shot to Herbert Iser in the bottom of the fourth inning. The Bears bounced back to plate their five runs in the top of the fifth inning and Helmer went on to earn his first collegiate win. From there, Daniel Caruso shut things down with a zero in the bottom of the fifth and Ryan Leckich threw 2.0 scoreless, striking out four batters along the way. 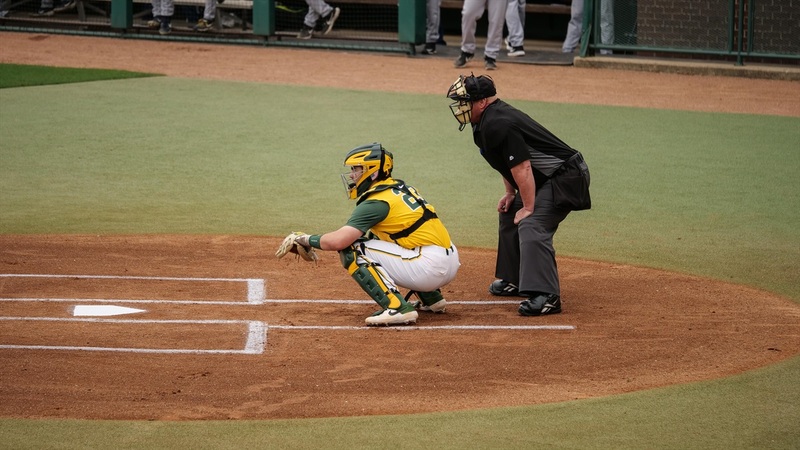 Right Luke Boyd faced the minimum in the eighth and Baylor closer Kyle Hill, despite it not being a save situation, closed things out with a 1-2-3 inning, including one strikeout. Overall through the last five frames, Baylor relievers held DBU to just two hits and walked just two batters while striking out seven batters to preserve the win. With Helmer earning the win to improve to 1-0 on the year, DBU reliever Kragen Kechley took the loss. *Since inserting Nick Loftin in the leadoff spot on March 10, the Bears have scored 111 runs on 170 hits in their last 15 games. Loftin is 27-for-62 with 5 HR, 18 RBI and 18 runs scored during the stretch. The Bears are 12-3 in such games. *Shea Langeliers connected on his first home run of the season, a solo shot in the top of the fifth that started the four-run inning for the Bears. *Loftin has a team-leading 15-game on-base streak and an 11-game hit streak. *Chase Wehsenser led the way with three hits on the day. *Jacob Ashkinos made his first start of the year and fourth of his career. *Davis Wendzel extended his on-base streak to nine games. *Kyle Hill made his 14th appearance of the year and recorded his 119th career strikeout in relief, tying giving him sole possession of Baylor’s all-time career relief strikeouts list. *Brooks Helmer threw a career-long 2.0 innings in his third appearance on the mound this season. He earned his first collegiate win on the day. *Luke Boyd made his 13th appearance of the season. *Ryan Leckich made his team-leading 15th appearance of the year. *Daniel Caruso made his 13th appearance of the year. *This was Baylor's 13thcome-from-behind victory this season. *Baylor is 5-1 in midweek games this season and 32-11 in midweek contests under head coach Steve Rodriguez. 2 – Baylor pitchers Caruso, Leckich, Boyd and Hill combined to hold DBU’s potent offense to just 2 hits through the final five frames to preserve the victory. The Bears head back home to resume Big 12 play and host No. 12 Texas in a three-game series. Game one is set for Friday, April 5 against No. 12 Texas at 8 p.m. CT. The game will be televised live on ESPNU.